HomeBlogWhat is Carpet Area, Built-Up Area & Super Built-Up Area? Let’s admit it – the terms and jargon thrown at us by Agents and Realtors have us staring at them cluelessly most of the time. While buying a house, terms such as carpet area, built-up area and super built-up area moslty evade our realm of understanding, or at least cause some confusion. In every residential complex, there are these three ways of calculating the area, or the square footage. They may not all sound very different, but there is in fact a BIG difference between carpet area and built-up area! Not knowing what each actually means is what could give Developers a chance to take you for a ride. However, it is not rocket science. Just a little reading and you will be pretty thorough with the terms. Here are some of the basics of Real Estate you should know. Carpet area is the area that can actually be covered by a carpet, or the area of the apartment excluding the thickness of inner walls. Carpet area does not include the space covered by common areas such as lobby, lift, stairs, play area, etc. Carpet area is the actual area you get for use in a housing unit. So when you are in search of a house, look at the carpet area and then make your decision, because that is the number that will give you an idea of the actual space at your disposal. Focusing on the carpet area will help you understand the usable area in the kitchen, bedroom, living room, etc. Nowadays, many builders don’t even mention carpet area at first, and usually charge on the basis of built-up area or super built-up area. Carpet area is usually around 70% of the built-up area. Built-up area is the area that comes after adding carpet area and wall area. Now, the wall area does not mean the surface area, but the thickness of the inner walls of a unit. The area constituting the walls is around 20% of the built-up area and totally changes the perspective. The built-up area also consists of other areas mandated by the authorities, such as a dry balcony, flower beds, etc., that add up to 10% of the built-up area. So when you think about it, the usable area is only 70% of the built-up area. 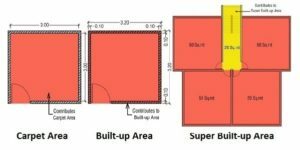 So, if the built-up area says 1200 square feet, it means around 30% (360 square feet) is not really usable, and the actual area you will get to use is only the remaining 840 square feet. Super Built-up area is a builder’s BFF! It is the area calculated by adding the built-up area and common area that includes the corridor, lift lobby, lift, etc. In some cases, builders even include amenities such as a pool, garden and clubhouse in the common area. A Developer/Builder charges you on the basis of the super built-up area which is why it is also known as ‘saleable’ area. Now let us consider this case – the rate is Rs. 2,000 per square foot and the super built-up area is 1,200 square feet, then the base cost will come up to 24 Lakhs. When there is more than one apartment on a floor, the super built-up area is calculated in a different manner. Let us assume this is the case. — The total common area is 1500 square feet, out of which the share of Apartment 1’s common area is 500 sq. ft. while the share of Apartment 2’s common area is 1,000 sq. ft.
Then the super built-up area of Apartment 1 is 1,500 square feet and of Apartment 2 is 3,000 Square feet. The super built-up area, as seen in this example, is divided in the ratio of the apartments’ built-up areas (in this case 1:2). Considering the fact that Builders and Developers usually price their apartments based on super built-up or ‘saleable’ area, being unaware of the fundamental difference between carpet area and built-up area and other terms leaves one running blind. Often the actual usable area is much lower than the super built-up area. Some Builders take into account the carpet area while charging you, but this is only in the rarest of the rare cases. 90% of the developers calculate the base cost on the basis of the super built-up area; the more the amenities the higher the super built-up area. Real Estate can be complicated, and you cannot change the rules and practices, but you definitely can make an informed decision when you’re aware of the various types of calculations for square footage, a seemingly major but actually simple job! This entry was posted in News on December 15, 2018 by Venkat Chunduru.